Our church began when several people recognized their church drifting away from Biblical truth and doctrine. As a result of conversations with their church and denominational leaders, prayer and Bible study, this group decided it was best to break fellowship and plant a new church – a bible-believing church with a caring heart. On June 29, 1997, the first worship service was held on the lawn of the old Utica Town Hall in Elo, Wisconsin. More than fifty people arrived for worship carrying their Bible and a lawn chair. faith, weekly Bible studies were started, meeting in various homes. Additionally, church business was discussed and the name Countryside Christian Church was selected. On August 1, 1998 prayers were answered and we called Greg Decker to serve as our first pastor. Pastor Greg cared for the flock spiritually, his wife Nancy ministered in music and his two children (Kelly and Carson) became such blessings to our growing church family! Although our main meeting place was the Utica Town Hall (Fisk), we occasionally held worship services at various locations throughout the area. 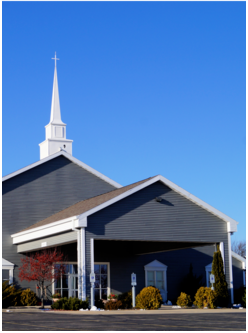 As our congregation grew in number, the need for a larger gathering place became necessary. Therefore we met at LaSure’s Banquet Hall (Oshkosh) and the Utica Town Hall on alternating Sundays. While being a mobile church, a Land Task Force was established for the purposes of finding and purchasing land. The committee met with countless landowners, searching for the perfect location. Our prayers were once again answered when God enabled us to purchase land at the corner of Burr Oak Rd. and State Highway 44. Having purchased the land, a building committee was established and a two-phase plan was developed. The first phase includes a multi-purpose room that is used for worship and fellowship; classrooms, nursery, kitchen and office space. A second phase contains a formal sanctuary and additional classrooms to be added in the future. 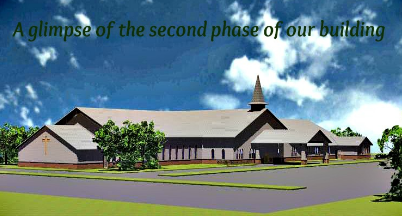 On June 14, 2009 a Prayer Blessing Service was held on the current site of Countryside Christian Church. Seven months later we held our first worship service on January 24, 2010 in our new building! After serving faithfully for 15 years, Pastor Greg resigned at the end of 2013. A pastoral search committee was established to seek out and call a new pastor. On January 5, 2014 prayers were once again answered as God provided and we called Dan Wetzel to serve as our second pastor. Pastor Dan, his wife Deborah and three daughters (Sofia, Aliyah & Isabella) are such blessings to our growing church family! We count it a great honor and privilege to participate in what God is doing locally as well as around the world! We look forward to seeing more lost souls saved, disciples made, believers baptized and the church growing in the grace and knowledge of the Lord Jesus Christ! Praise the Lord! Blessed be the name of the Lord from this time forth and forevermore!